Installment shopping with just a few taps, now you can with My Home Credit App. 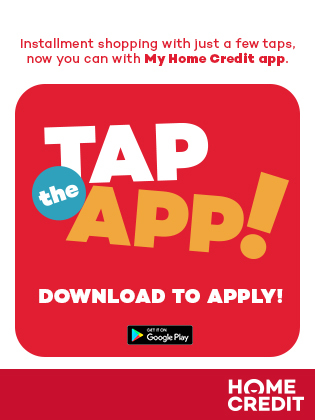 Whether you’re looking for a brand new gadget, appliance, or furniture, now you can simply TAP THE APP for easier, faster, and more convenient loan application using the My Home Credit App. Download it now for FREE on Google Play Store. You can also use it to monitor your loans, chat with us, and stay updated on our latest promos and offerings. Our approval process usually completed within 1 minutesafter completing the application form with our Sales Agent. This is designed to make sure approved customers get to bring home their new purchases within the same day!